Seneca (Lucius Annaeus Seneca: 3 BCE – 65 C.E.) the Roman senator and philosopher, was exiled to Corsica from 41-49 AD by the emperor Claudius having been accused of adultery with Julia Livilla, one of the sisters of the former emperor Caligula. The accusation came from the emperor’s wife Messalina who was suspicious of Caligula’s sisters and felt they represented a threat. Julia was also sent to exile, in her case to the Pontine Islands, having already accompanied her sister Agrippina there in a previous exile following an unsuccessful attempt to overthrow their brother, the emperor Caligula. 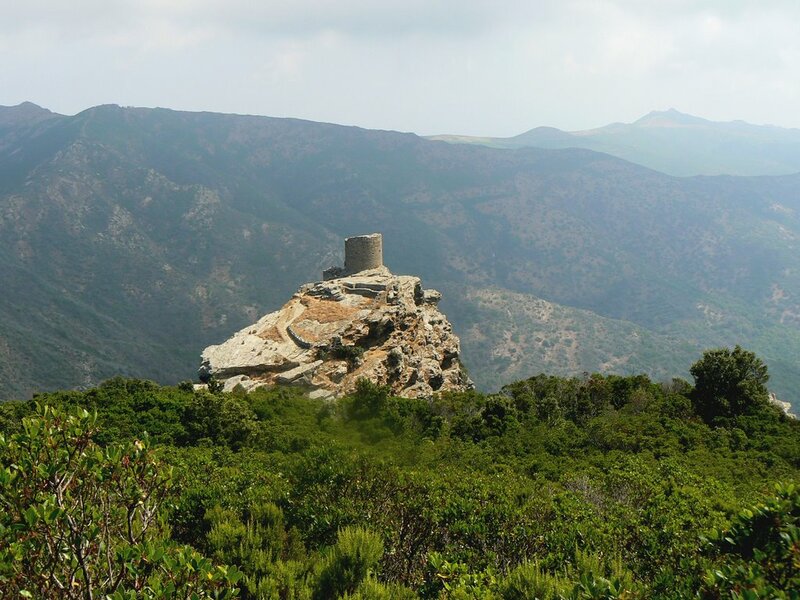 Legend has it that Seneca spent his exile in an isolated tower above the village of Luri in the Cap Corse. But this Torre di Seneca in fact dates from the 16th century and it seems likely that he stayed at Mariana or Aleria. Seneca seems not to be have been very impressed. He describes his surroundings as rocky, unproductive and unhealthy and the people as the worse kind of vengeful, thieving, lying heathen. 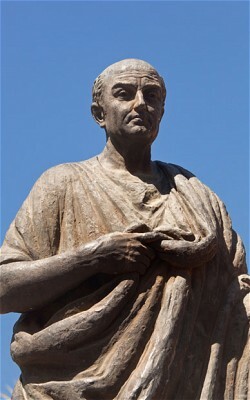 In Corsica, Seneca also wrote De Consolatione ad Polybium. This addresses Polybius, who works for the emperor Claudius, following the death of his brother. Rather than personal condolences, Seneca offers a general essay on grief and bereavement without even mentioning Polybius’ deceased brother by name. Seneca was recalled from exile in c.48 C.E. by Julia’s sister Agrippina and became tutor to her son, the future Emperor Nero. When Claudius died in 54 C.E. Seneca became one of Nero’s most important advisers increasing his wealth and influence. Although Seneca portrays himself as a Stoic philosopher, indifferent to wealth and fame, his actions did not live up to his professed ideals and his admiration of Claudius may not have been entirely sincere. Did his time in Corsica, so far from the good life in Rome, cause him to reflect and become more generous and constant? Hardly. He remained ready to switch sides and turn from flattery to ridicule when it suited him. Following the death of Claudius, Seneca wrote The Apocolocyntosis of the Divine Claudius, a vicious satire of the deification of the recently deceased emperor. Apocolocyntosis means to transform into a gourd ie: a cabbage-head or idiot. In Claudius the God, Robert Graves translates this as The Pumpkinification of Claudius giving a modern twist to the insult. Claudius is sent to Hades, where he is greeted by the spirits of those he had killed and is then sent before a tribunal to be tried for his numerous murders. Seneca eventually fell out of favour with the emperor Nero. He retired and was a few years later forced to commit suicide after being accused of plotting to kill the emperor. This entry was posted in Culture, History and tagged Corsica, Seneca. Bookmark the permalink. Loved your blog and writings on Corsica.